Day 1 Day 2 Day 3 Day 7 Healed. 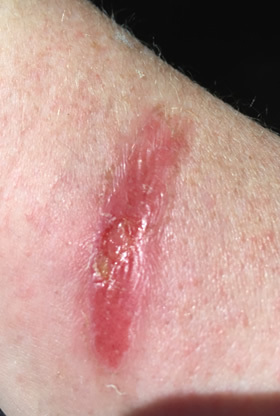 Note that the original burn wound is quite deep, inflamed and open making it prone to infection. After 2 days' treatment with wheatgrass extract, the wound is sealed and the inflammation reduced. 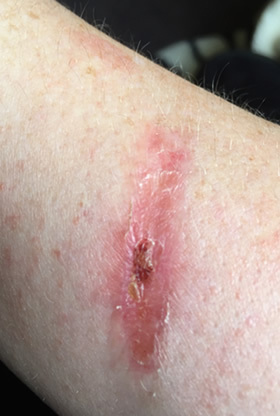 By Day 3, inflammation is markedly reduced and the wound completely sealed. 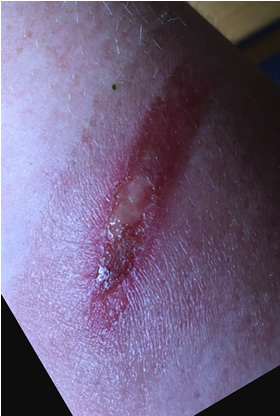 This is highly unusual for burn wounds which frequently remain indolent and difficult to heal. At 7 days, the wound is completely healed. 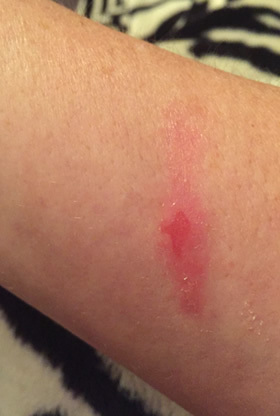 To my knowledge, there is no other treatment for second degree burns that can achieve such results in such a short time. All these demands have now been met by a highly effective, pocket-sized spray. Even for oral burns! A First Aid Kit Must! Spray it on ASAP! Packaged in a 100ml. 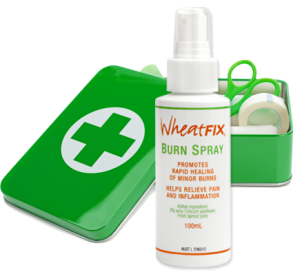 easy-to-use, pocket-sized spray bottle, WHEATFIX BURN SPRAY is ideal for domestic, industrial, and medically related services - ambulance, fire brigade, hospitals, first aid, etc. 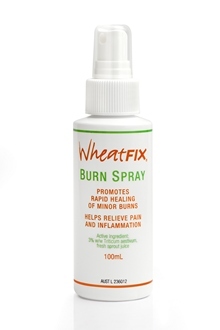 Please contact us at info@wheatgrass.co.nz for supporting research material. and Citrizan Gel in the topical treatment of second-degree superficial cutaneous burns. radiation therapy: A randomized controlled trial. Chlorophyll: A preliminary report of its use in two cases of second and third degree burns. Hawton, H. 1950. Med.J.Aust. 337-340. Wound infection, ulcers, burns, abscesses etc. Growth hormone system: skin interactions. Effect of Triticum aestivum (wheatgrass) juice on wound healing in rats. Singh, J., Sethi, J. Yadav, M., Sood, S., Gupta, V. Intl. J. Nat. Prod. Sci. 2011; 1: 15-20. Wheatgrass extract as a topical akin agent for acute radiation skin toxicity in breast radiation therapy. Currie, G., Wheat, J. J. Australian Trad.-Med. Soc, 2006, 12(1): 7-11.